The landscape pioneer was, at the very least, a lucky guy. To be part of the first generation of artists to discover the high Sierra and create a body of work that defines the place to this day. It feels like we all spend a lot of time looking for the old master’s tripod marks. Now, of course, everyone is a photographer, dangling iPhones and digital slr’s, spouting megapixels and dragging tripods through the woods while wearing the obligatory khaki photo vest. What would Ansel make of all this? The park’s change from wilderness to amusement park? The landscape itself is unchanged, unchanging, but I wonder if the spirit isn’t slowly leaching away, tiny parts of its soul stolen with each mindless snapshot. I arrive in the valley long after dark and drive to the classic Yosemite Valley overlook. It’s now a parking lot, with overflow across the busy highway. Even at 11:00pm, a half-dozen tourists cluster around digital cameras trying to capture the vista lit by a rising moon. I join the throng, watching ghostly light on El Capitan and the valley beyond. I drive the park road and hike around for hours, watching the summer stars circle overhead, the landscape gone spooky and leached of color by the full moon’s glow. By four, I’m fading and desperate for sleep. WWAAD? Maybe he’d gut it out until that magic sunrise light. But whatever he did, I’m pretty sure that he would be smart enough not to wind up sleeping curled up in the front seat his car. And even if he did, I bet he never woke up, as I unhappily did, to some family taking snapshots of him drooling in his sleeping bag. Photographed July 8, 2009 in Yosemite National Park, California using a Hasselblad 2000 with Rodenstock 3x loupe on Fuji Neopan 400 black and white negative film. This entry was posted on Sunday, December 11th, 2011 at 4:20 pm. 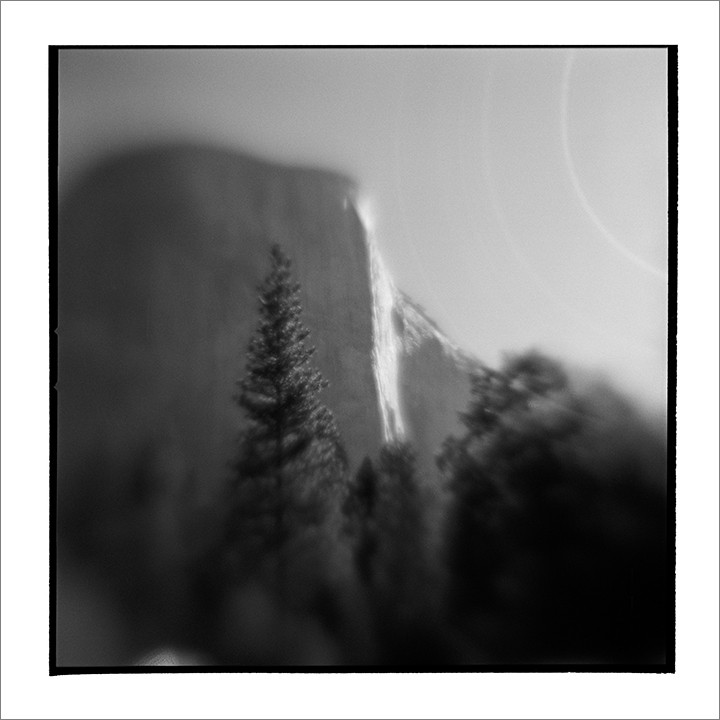 It is filed under Monochrome and tagged with Americana, Blurry, California, Landscapes, North America, Yosemite. You can follow any responses to this entry through the RSS 2.0 feed.